Craftin' Caro: Stampin' Palooza THANK YOUS! 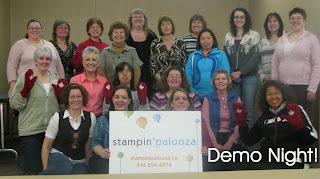 I want to take a moment to thank everyone who came to craft in Toronto and attended this weekend's Stampin' Palooza events for helping make it a truly fabulous time. I was thrilled to see so many smiling faces and really appreciated each of you who stopped to tell me what a great time they were having. It sure does the heart good! I look forward to sharing many wonderful pictures with you here on the blog over this next week. Special thanks also go out to my amazing presenters who did such a good job: Linda Hansen, Blair Moch, Chanda McLean, Dina Anker, Lesley Poper, Michelle Sturgeon, Christyne Richardson and of course I can't forget my very own "Big Shot" Brent. My incomparable helpers for both the day and behind-the-scene efforts can't be neglected either: Bernard from WPI Events, Brian Korson of Video Excellence, Christyne, her daughter Lauren, Michelle Surrette, Serena & Granny "Weezie". Thanks also to the very talented stampers who brought display boards and artwork to share. If I've managed to forget someone in these lists...please forgive me. Take a look at our 4 Name Badge Contest winners: Caroline with her flower pot, mom & daughter pair Michelle & Barbara, and Julie with her MDS badge. I can't wait to post the Badge Parade participants as well, since they were all soooooo cute! But the FUN hasn't ended as we want to keep the party going, and there's still time for you to get involved as Stampin' Palooza ONLINE goes live this Friday! Over the next 6 weeks, 'Palooza Peeps will get access to hundreds of wonderful display board samples and photos posted, exclusive videos, six bonus project tutorials using the featured "With All My Heart" set, stamping challenges and MORE. For those of you who missed out on the weekend's festivities but still want to be included, I'll be posting more information about how you can order the "Palooza-TO-GO" kits. So stay tuned! It's me! It's me!!! WOOT!